If you thought that the ProBatter systems were designed exclusively for batting practice, you would have sold the equipment short and not gotten the most out of your investment. While it certainly is the best training tool ever developed for hitters of all ages, it is also an excellent way to provide practice for your catchers under game-like conditions. Working your catchers with the ProBatter system, particularly, the ProBatter Professional system, is an excellent way to refine their pitch framing and blocking skills. ProBatter Sports will work with its customers to design a programmed “Catchers Sequence” of pitches for the ProBatter Professional simulator so that you can work your catchers under game-like conditions. 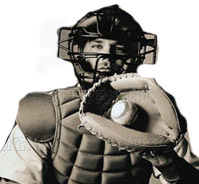 The framing series consists of a series of different pitches that are thrown both inside and outside the strike zone so that your catcher can work on his receiving techniques, including proper positions of his glove above and below the waist as well as bringing the “close pitch” back into the strike zone. Your pitchers will certainly appreciate this drill. The blocking sequence consists of a series of curve balls and fastballs both over the plate as well as in the dirt, which force the catcher to move his body and block the ball in the dirt. The pitches are “randomized” so that while he knows that some of the pitches will require blocking, he won’t know the exact ones. This will help him develop the proper footwork required for blocking balls in the dirt as well as the muscle memory needed for games. We will all agree that this is a far more efficient way to train catchers than having a coach bounce tennis balls in front of him during practice. One of the many things it can teach you is plate recognition. As a batter, this is one of the hardest things to master. Knowing what a strike or on the outside corner a ball is one of the hardest thing things to master. The PX-2 is so precise that the pitch location can be moved almost down to the inch. By setting up the location to be right on the outside corner or just off, the batter can see what the slight difference is between the two. These two pitches can be thrown over and over until the batter gets it. Now let’s take this to the next level. The PX-2 can be set to throw curves or sliders on the outside or inside of the plate. This will teach the batter to recognize what is a strike or a ball with different pitches. Also, the batter can learn how to hit the curve or slider on the outside corner to the opposite field like it’s supposed to be hit. Most batters try to pull the ball. This usually results, more times than not, into a weak ground ball out. But, if you can develop this batter in to one who can hit pitches the opposite way, and pull balls on the inside corner, they become extremely dangerous. Our PX2 is so precise that the operator can select exact locations. By using the remote Kiosk, the operator can set up pitch sequences to pre-select pitches, so the batter feels like it’s a real at bat. Another important training tool the PX2 has is for the batter to work on his timing. This is something a Jugs or any other machine cannot due without a simulator. When a batter hits off a Jugs for an example, the ball comes out of the tires towards home plate. The problem is it’s hard to pick the ball up. Usually it takes the first 5 to 8 feet before you realize the ball is coming towards home plate. The batter is immediately off balance. Either the batter steps too early which results in a weak pop up or ground out or steps too late which results in a jam shot with a possible broken $125 wood bat. With the PX2 video simulator, the batter can see the pitcher all the way through his windup. This allows the batter to get into the load position then start the motion forward to contact the ball. Early pitch recognition is something a regular pitching machine cannot help a batter improve on. A PX2 can make this second nature to a batter. It is a known fact that the sooner a batter can pick up the ball the sooner they can recognize if the pitch is going to be a ball or strike, fast ball or curve ball. The batter will have more success because they have extra time to prepare and adjust. A successful batter watches the pitcher start his windup then moves his eye to the throwing shoulder then to the arm then to the hand. By going through this sequence, the batter is in total focus on the ball and the pitcher’s movements. The batter is able to pick up the type of spin. This is a training tool that is impossible to duplicate on a normal pitching machine.